This recipe originally appeared in the June 1995 issue of Gourmet; it's now available at Epicurious. My friend Ann substituted strawberries for the blackberries. Still one of the best cakes I've ever eaten. Preheat oven to 350 degrees. Butter and flour an 8-by-2-inch round cake pan. In a large bowl with an electric mixer, beat together butter and sugar until light and fluffy. Add remaining cake ingredients and beat on low speed until combined. Beat batter on high speed until pale yellow, about 3 minutes. Pour batter into prepared pan and bake in middle of oven for 40 minutes, or until a tester comes out with a few crumbs adhering. While cake is baking, make the rosemary syrup: In a small saucepan, simmer all syrup ingredients, except vanilla, for 10 minutes. Remove pan from heat and stir in vanilla. Cool syrup for 30 minutes and strain through a sieve into a 2-cup measure. Cool cake in pan on a rack for 10 minutes. Invert cake onto hand and return, right side up, to rack. While cake is still warm, gradually brush ⅓ cup syrup over it, allowing syrup to soak in before adding more. Chill remaining syrup in a small pitcher, covered. Syrup-soaked cake may be made one day ahead and kept wrapped in plastic wrap at room temperature. 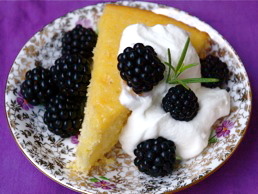 Serve cake, cut into wedges, with whipped cream, blackberries (or strawberries), and remaining rosemary syrup. Be sure to read Jamie Passaro's essay on post-partum potluck.